AD Reporting is a reporting tool for Active Directory. AD Reporting contains a large number of pre-built reports plus a built-in scheduler allows you to automate reports on Users, Computers, Groups, Passwords and Office 365 on a hourly, daily, weekly or monthly basis. Active Directory Reporting, automated, simplified and powerful. Produce awesome reports in minutes. Do you need to find the true last login time for users and computer accounts? Do you need to receive a report of users who haven’t logged on in the last 30 days? 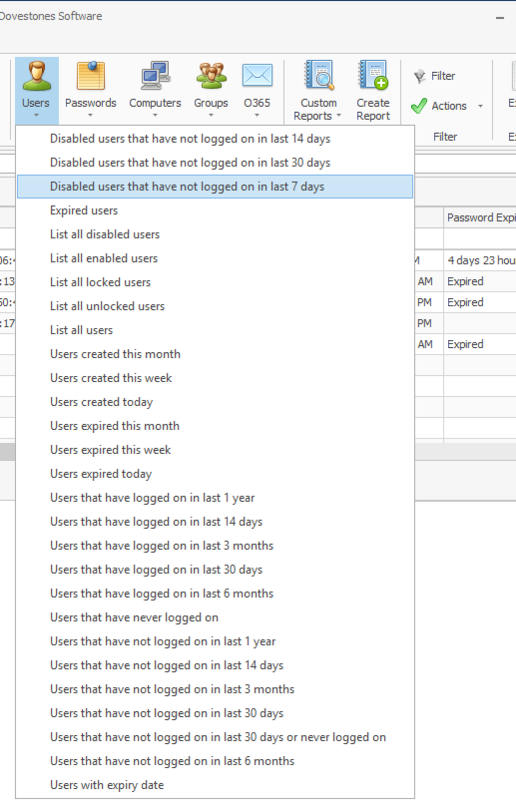 Do you need to automatically disable accounts that haven’t logged on in 60 days? Identify accounts in need of attention, e.g. disabled, locked, never logged on, or with non-expiring passwords. Actions can be applied to users or computers. For example, you can disable users who have not logged on in 60 days or you could move all computers which haven’t been used in 90 days to a specific OU. Actions can be used within the scheduler so you can run a weekly report for users that have not logged on in 30 days and disable their accounts before removing them from all groups after 90 days. When querying Active Directory using the lastLogon column the program will query each domain controller for the most recent lastLogon time, you can click the cell to see the time the user last authenticated against each Domain Controller. AD Reporting has a built-in scheduler that you can use to perform hourly, daily, weekly, monthly or one-off reports and exports. The scheduler can send the report results via email and also perform actions on the results such as disabling, deleting, moving etc. 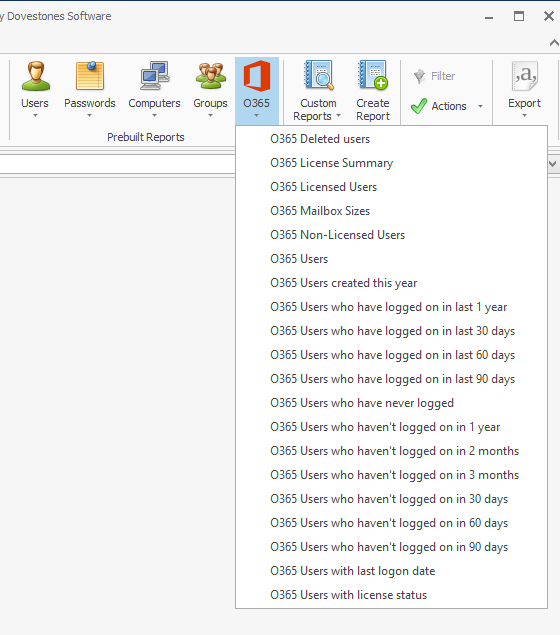 Create custom reports, for example, locate all users in California who haven’t logged on in the last 20 days or computers running older versions of Windows that have logged on in the 30 days. There are many pre-built reports covering Users, Passwords, Computers, Groups and Office 365. Reports can be sent via email in CSV, Excel, Word or PDF format. A Windows service handles all the scheduled reports in the background so the computer can be logged off. To use the reports for Office 365 the software below is required. Windows Azure Active Directory Module for Windows PowerShell (64-bit version).